As each Shabbos wanes and we prepare to go forth to the new week ahead, we bid Shabbos farewell by dwelling on the great divide between Shabbos and the other weekdays, as well as the divide between all things holy and the mundane, with the recital of Havdala. Though not of particular conceptual relevance to havdala, we are instructed to incorporate as well the partaking of a pleasant fragrance, along with the recital of the requisite beracha, that of Borei Minei Besamim. Why indeed? We are taught that with the dawning of Shabbos each Jew is imbued with a supplementary measure of spirituality, an “extra dose of Neshama”. As Shabbos departs, though, so too does the “Neshama Yesayra”. How do we deal with this loss? The Torah repeatedly alludes to a direct connection between the Neshama and a person’s nasal passageway, as well as sense of smell. A topic deserving treatment in it’s own right, what is of relevance to this discussion is that we are taught that by virtue of enjoyment of our sense of smell, we can bring a measure of solace to our natural weeklong Neshama on this loss. While we are instructed to partake of pleasant smell, we are given wide latitude in choosing which fragrance to use to satisfy this requirement. Broadly, any natural fruit, plant, vegetable or herb which emits a strong pleasant aroma may be used. As for synthetically created aromas, it is highly questionable if they warrant a beracha, and as such, should not be used for Besamim. Which brings us to the question: Can one simply pick up a jar of coffee, and make a beracha on its aroma? The Mishna Berura clearly rules that one may in fact make a beracha on the fragrance of coffee. He does, however, add the all important caveat that the coffee must be hot. Though the reasoning is not elaborated upon, it seems the Mishna Berura as well as the sources he cites maintained that the coffee bean alone is not sufficiently fragrant to warrant a beracha. Only by method of heat will aromas of sufficient strength be released. It is not clear if the heat the Mishna Berura refers to is the heat at the time of roasting the beans, or the heat of adding water to create a cup of coffee. Regardless, it would seem the ruling would apply equally in both cases. At this point, it would seem one could generally go ahead and make a cup of coffee and recite a beracha over the aromas (albeit preferably prior to the addition of milk). However, while this generality would hold true in the days of the Mishna Berura and eras prior, in today’s ever advancing world of coffee production things are a bit more complicated. To simplify matters, it is necessary to provide a bit of background on the parameters of Birchas HaReyach. Though there many methods of creating most wonderful smells, not all forms are equal, and many are considered insignificant in halacha, whereby no beracha may be recited. The key here is a concept called Reyach Sheyesh Bo Ikar, loosely translated as an aroma emanating from a clear tangible source. An aroma lacking this criterion may smell quite pungent, but lacking source, would be deemed insignificant. Reyach Sheyesh Bo Ikar – Beracha Required – Cloves, Cinnamon Sticks, Hadassim (when sufficiently fresh and fragrant), Spices, etc… In these instances, the source of the aroma is readily apparent. This category would include as well oils and perfumes where the smell was created by natural (not synthetic) means AND the spices, herbs etc… are still present in the mixture. Reyach SheAyn Bo Ikar – No Beracha – Aromas absorbed into clothing. Although one working in a spice factory might have quite a distinctive scent absorbed into his clothing, simply smelling his clothing would not warrant a beracha, as there is no direct connection to the source of the aroma. An additional scenario which falls into this category would be that of smelling a completely empty spice container. The container may well be suffused with the distinctive scent of the original contents. Nonetheless, as the scent in the container is at present not connected to the spices, it is an odor alone, a Reyach SheAyn Bo Ikar, and no beracha may be recited. Reyach SheHaya Bo Ikar – This category refers to an aromatic mixture which did in fact contain the requisite “Ikar” at one point, but where the source substance was later strained out or otherwise removed from the mixture. An example would be a perfume or fragrance which was created with various spices, but subsequently had the spices filtered out, leaving the aromatic liquid alone. This category, falling between the two aforementioned categories, is subject to debate, creating a “Safek Berachos” conundrum. [A situation where one might be obligated to recite the beracha, yet could not do so out of fear that if in fact no beracha was warranted, the beracha recited would be in vain, a transgression in its own right]. The Shulchan Aruch states that as such it would be appropriate to avoid smelling such substances. The Mishna Berura, however, rules in line with many achronim, that one who does not wish to be stringent in this regard is certainly well allowed to partake of these fragrances lechatchila and to recite a beracha. So how does this all pertain to coffee? “Turkish” Coffee – This style and similar variants refer to a powder of ground beans mixed with hot water. The ground beans are not soluble, leaving a thick murky mixture near the bottom of the cup and much perciptible sediment throughout. Here, the source of the aroma, the ground beans, is readily apparent, and this would certainly qualify for a beracha, included in the first category above. It is this form of coffee that was prevalent in the times of the Mishna Berura. Brewed Coffee – Be it coffee brewed in a traditional coffee maker, a “french press” coffee maker, pod-style Keurig, Nespresso, or other form, most brewed coffee today involves pouring hot water over beans, and then having the mixture filtered leaving a result of a particle-free coffee. Although the beans were present in the mixture, once they are removed, it would shift the status of the coffee to one of “SheHaya Bo Ikar”, the third category. One can certainly go ahead and make a beracha on this form of coffee, although it would not be as ideal as using something falling within the first category. Cold Brew – As with standard brewed coffee, Cold Brew coffee is created using water and coffee beans. However, the process of creating the coffee, as evident in the name, involves no heat whatsoever. In this case, the simple technique is merely to place the beans into a pitcher of cold water and leave refrigerated for anywhere in the proximity of 18-20 hours. The coffee flavor is extracted by marination, “Kavush”. As stated previously, the Mishna Berura rules that only the aroma of coffee created via heat has sufficient strength to warrant a beracha. Hence, no beracha may be recited, and this may not be used for Besamim. Instant Coffee – A standard container of instant coffee contains no beans or bean particles whatsoever. The process of producing instant coffee runs basically as follows: Hot water is mixed with beans to create coffee quite similar to every cup of brewed coffee. The difference, of course, is that this is done on a scale several thousand times the size of the coffee one brews at home. As with brewed coffee, the beans are removed from the mixture leaving only an enormous volume of brewed coffee. This liquid is subsequently “dried out” into little granules by removing the water content from the coffee. This is generally done by either “Spray Drying” or “Freeze Drying” the mixture. The remaining particles are not beans at all – they are simply what remain after you dehydrate a cup of coffee. At this point, there would be room to debate the status of aromas emanating from these particles. Is this a case of a smell lacking tangible source, or could this be equated to this very same coffee prior to dehydration where, as stated above, it would fall into the third category of Reyach SheHaya Bo Ikar? In truth, though, this question remains academic but not of practical relevance. In actuality, the instant granules offer not much of any fragrance at all. That delicious aroma wafting up when you peel off the covering of a new container? That’s the fragrance of a spray which is sprayed onto the particles to boost their appeal, not the smell of the coffee particles themselves. In fairness to the coffee companies, this spray is generally not some random synthetic concoction, but rather is taken from the evaporated liquids created during the spray drying process, allowing the companies to argue they are doing nothing more than “spraying the coffee with the coffee itself”. 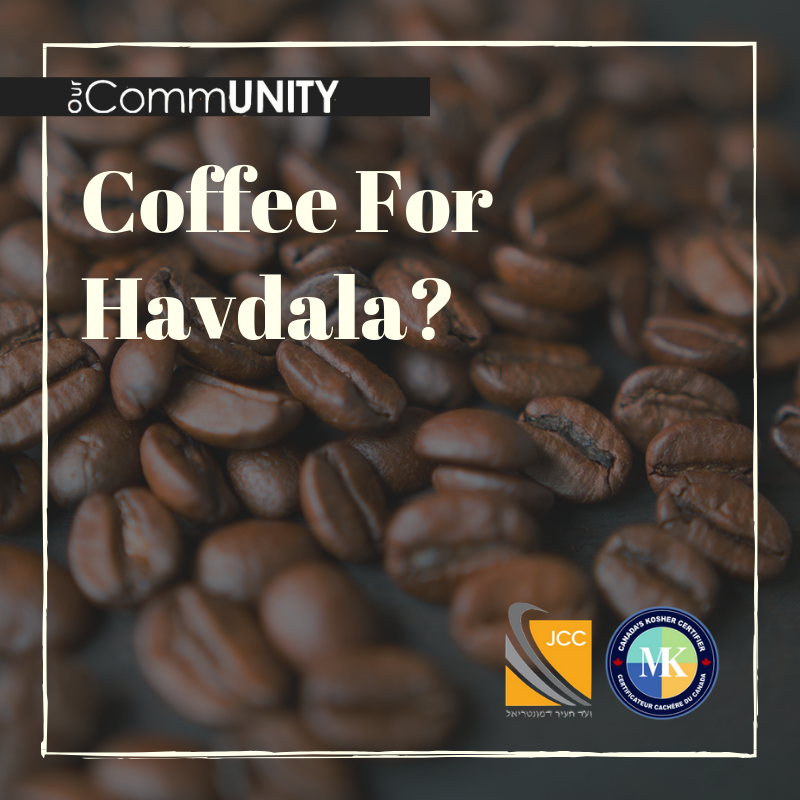 Regardless, as far as halacha is concerned, the infusion of these fumes into coffee particles carries no more significance than the absorption of spice fragrances into a worker’s clothing. This clearly is a case of Ayn Bo Ikar, where there is no tangible connection to the source of the aroma, and no beracha may be recited. Starbucks Via, Nescafe Gold and Instant with Microground – Of late, the constant evolution of coffee production has resulted in a number of new innovations including those designed to improve the flavor of instant coffee. The specific intent, in this regard, is an attempt to bring the flavor as close as possible to that of a freshly brewed coffee, while maintaining the practicality of instant coffee. To this end, a number of companies, including Starbucks, Nescafe and others have introduced high-end lines of instant coffee created by a mixture of both traditional instant coffee as well as microground beans. Essentially, these companies have created a process wherein by grinding roasted beans to an extremely fine degree it is possible to make these beans soluble. The result is a cup of coffee containing the actual bean, yet will usually have all particles dissolved leaving little or no sediment. As this coffee contains the actual beans, it would qualify as Reyach Sheyesh Bo Ikar, and would be perfectly ideal for usage. An important note: The flip side of having real beans present is the creation of a serious concern about permissiblity of usage on Shabbos. A Rav should be consulted before Shabbos use.